Ripples break the mirrored surface distorting reflections of moss covered trees. Cicadas softly call from hidden spaces as twilight fades into the dark of night. their knobby roots jutting along the waters edge. 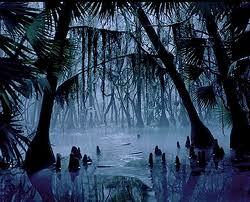 Shrill chirps ring as tiny green frogs emerge to sing a nightly chorus echoing through the bayou. Wondrous and frightening creatures smartly slink in the murk as some slip off to sleep. A full moon rises along with whispery winds pushing through humid air. Twinkling flashes fly erratically momentarily brightening a place of darkness. An owl hoots eerily in the distance drawing you into the enchantment. A mystical realm not to be taken for granted, not to be ignored for a more promising scene. Can you envision the beauty within? Can you see? Time seems to touch me increasingly faster. I look to my home for the answer. In my home... time stands still.